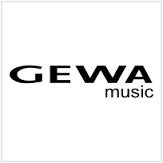 Browse GEWA | Musical Instruments | GAK. Buy GEWA products through GAK. Shop GEWA with next day delivery and 0% finance available from the UK’s no1 musical instrument store. GEWA Classic Cymbal Bags are made from reinforced black Cordura with a 10mm foam rubber padding. GEWA Premium Bass Drum Bags are made from reinforced black Cordura with a 20mm foam rubber. Guitar cases can now be carried like rucksacks as well, this strap has adjustable nylon straps with clip locks that surround the waist of the case. Made from a high quality Cordura 600 Denier material that is both tearproof and water resistant. A deluxe solid wood Piano bench from Gewa featuring a﻿ beautiful high gloss Black finish. A deluxe solid wood Piano bench from Gewa featuring a﻿ beautiful matte black finish. Classy keyboard bench for keyboards, digital pianos or home acoustic pianos. A deluxe solid wood Piano bench from Gewa featuring a﻿ beautiful high gloss White finish. Piano bench with smooth height adjustment.